Now, stop messin’ about! Another English Heritage blue plaque has just gone up in London – and it’s to Kenneth Williams, comic actor, raconteur, star of the Carry On films, and divine deliverer of the double entendre. The new plaque is prominently sited – right opposite Madame Tussauds, on a block of flats called Farley Court. Kenneth Williams moved into flat number 62, on the ninth and top floor, in October 1963: ‘My bedroom looks out over Regent’s Park. The trees are turning now and the sight is beautiful. I can see all the traffic twinkling down the Marylebone Rd … It’s all so marvellous, I could cry’, Williams recorded in his famous diary. 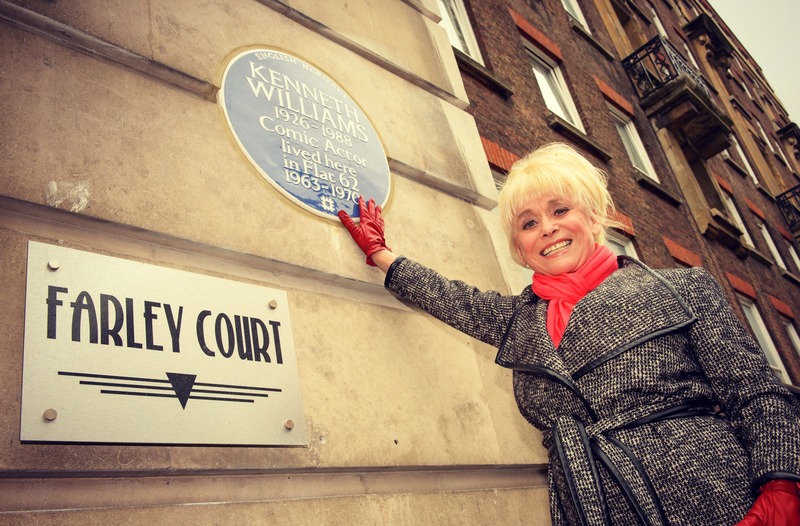 Barbara Windsor, who gamely came along on a cold February day to help English Heritage to ‘launch’ the plaque, remembers how happy her old friend Kenneth was when he moved into Farley Court. ‘It was lovely, very plush. And when I visited, he DID let me use the toilet’, she laughs, giving the lie – at least in her particular case – to one tale of his eccentricities. The six-and-a-half years that Kenneth Williams spent at Farley Court were some of his most successful. A regular on the radio show Round The Horne, and later on Just a Minute, he also took on some of his most memorable Carry On roles, including the Khasi of Kalabar in Carry on up the Khyber, Dr Kenneth Tinkle in Carry on Doctor and, perhaps best of all, Julius Caesar in Carry on Cleo. It was to this flat, in the summer of 1964, that Williams would have returned from filming, having delivered the line: ‘Infamy! Infamy! They’ve all got it in for me’. Williams left Farley Court in April 1970, because he was starting to find it expensive and – as Barbara put it – ‘a bit “la-di-dah”, he always thought of himself as one of the people’. And yet Williams could be very scathing about humanity en masse – you can almost hear his nostrils flaring when he writes of looking down from his flat at ‘the nits crowding round outside the waxworks. How I loathe them and Madame Tussaud’. Speaking of which, apparently Tussauds carted Barbara’s waxwork off to Blackpool last week. Baker Street’s loss, I should say, though the real life version is much better value. This is the second plaque to Kenneth Williams that Barbara has helped to promote. The first, put up by the Dead Comics Society, was at Marlborough House, Osnaburgh Street, near Regent’s Park – Williams’ final home, which was lost to demolition in 2007. Other plaques mark the site of Williams’ birthplace off the Caledonian Road (11 Bingfield Street – put up by Islington Council), and his childhood home at 57 Marchmont Street, Bloomsbury, the erection of which (‘Ooh, matron!’) was down to the Marchmont Association. A question that often comes up about plaques is what their recipients would have thought of the honour. And Kenneth Williams was not always comfortable with public attention and recognition – unlike Barbara Windsor, who chats eagerly with passers-by and poses for selfies with their star-struck kids. But, as she mounts a small step-ladder and smiles for the cameras next to the iconic blue roundel – ably supported by two English Heritage colleagues struggling to stay out of shot – Barbara is sure about one thing: ‘If Kenny could see us all now, he would absolutely wet himself’. Howard Spencer is English Heritage’s Blue Plaque Historian. Previously he worked as a journalist and as an editor on the Oxford Dictionary of National Biography. An erection that Kenneth would undoubtedly have been most proud.